Were the Border Patrol agents wearing MAGA hats when they grabbed Rosa Maria Hernandez as she left her hospital room? “It’s a shocking case — the most outrageous case I’ve ever seen. Is it a preview of things to come?” ACLU attorney Michael Tan said to me about the incident, shortly after the civil-rights group filed suit against the federal government demanding the 10-year-old child’s release from a detention facility in Texas, 150 miles from her home in Laredo. Rosa Maria, who has cerebral palsy, was arrested at a children’s hospital on Oct. 25, the day after she had emergency gall bladder surgery. She’s been at the detention center for a week now, under the bureaucratic “care” of the Office of Refugee Resettlement, which wants to ship her back to Mexico. The child’s problem is that, although she has lived in the United States since she was three months old, she’s illegal. Her mother brought her into the U.S. — from Nuevo Laredo to Laredo — so she could get better medical care. But there’s no mercy for the illegals. Last week, Rosa Maria’s ambulance, which was taking her to a children’s hospital in Corpus Christi in the company of an adult cousin, a U.S. citizen, was stopped at an immigration checkpoint. The Border Patrol agents demanded the little girl’s papers. She had none. They determined that she was illegal and followed the ambulance to the hospital; agents stood outside the child’s door for a day. “Throughout the time that Rosa Maria was in the hospital, male Border Patrol agents followed her every move, sitting next to her in the waiting room, remaining in a nurse’s screening room while her vitals were taken, and even peeking into the operation area while she was awaiting surgery. The agents stayed in the hospital over the objections of hospital staff. . . . The agents told the cousin that the child and her mother had two options: The mother could agree to Rosa Maria’s immediate deportation to Mexico through “voluntary departure,” or she would be arrested and held in a detention center. The family chose the lesser of these two evils: arrest and detention. I repeat: The little girl was recovering from gall bladder surgery when she was arrested, i.e., bureaucratically kidnapped. She was still in pain. Tan told me that when the ACLU initially contacted the Office of Refugee Resettlement to demand Rosa Maria’s immediate release, “we were still hoping it was a case of overzealous Border Patrol agents. If we could get the case before the right people in the agency” — you know, reasonable, sane people — the child would be released back to her family. “That did not happen. The government doubled down. Enough, enough! What’s taking place here is institutional racism, aggravated in the Trump era by an uptick in border patrol aggression. 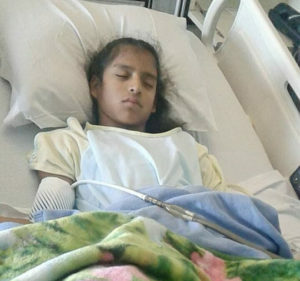 The idea that a 10-year-old girl with cerebral palsy, who has lived in the United States since she was three months old, could be illegal — that any human being, in his or her very existence, could be illegal — freezes my soul. This is bureaucracy vs. humanity. And it rips open the hypocrisy of the “limited government” crowd, who cringe at resources being used to help people — universal health care, free college tuition — but are OK, I presume, with money being allotted to maintain the various, enormously costly, wars against our enemies. Rosa Maria Hernandez is not my enemy. And I have no tolerance for government resources being used to dehumanize people. It may be that this young girl’s arrest is partially a function of Trump policies — immigration arrests went up 37 percent shortly after he took office, the Washington Post reported — but, as usual, his reckless feeding of the bigotry of his base illuminates institutional prejudices that were already present. The ACLU has urged people to call the Office of Refugee Resettlement and demand Rosa Maria’s release, and it has a website to facilitate the process. This may be a good place for us to start reclaiming the country.